NOAAA woman was able to send aid to her relatives after seeing the word ‘HELP’ spelled out on their lawn from aerial images taken after Hurricane Michael. Following Hurricane Michael, the National Oceanic and Atmospheric Association released aerial images of the destruction. 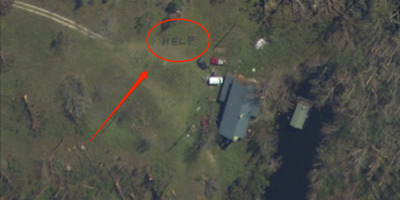 Amber Gee looked up her grandmother’s property in Youngstown, Florida to see the damage, and noticed that her relatives had spelled out the word “HELP” on the lawn. She was then able to inform emergency responders that her relatives were in need of rescue, and they cleared the path to the property. A Florida woman was able to send aid to her storm-trapped relatives, after spotting their call for help on an aerial image of Hurricane Michael‘s destruction. Amber Gee told ABC News on Wednesday that she evacuated with her two young children the day after the hurricane hit, and figured her relatives in Youngstown, Florida did the same. But when she looked up her grandmother’s address on aerial maps released by the National Oceanic and Atmospheric Association, she saw the word “HELP” spelled out in downed trees on the lawn. Gee then used the pictures to get help from local law enforcement, who sent crews to clear the way to the home at around 2 a.m. on Sunday. “Apparently they had to cut through a lot of downed trees to get there,” Gee told ABC. At the house, they found Gee’s aunt, uncle, and a family friend hunkering down. Gee’s grandmother, who is in her 80s, had evacuated before the storm. As of Monday, 18 people have been confirmed dead in Hurricane Michael. That number is expected to grow with dozens still missing in the hardest-hit town of Mexico Beach.